New plans to clear away road space in central Amsterdam’s ‘Entree’ will see a return of the city’s maritime origins, but with the added twist of added bike parking occupying the water. Battling with overcrowding of bikes on the street, the cycling modal share leader is challenged with parking. 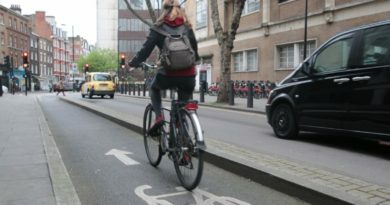 Last year the city’s authorities reclaimed space occupied by some 64,000 bikes chained to railings and lamp posts. New plans have now been, err, floated to bring about a series of pontoon bike docks, as well as excavating below the canals to create underground bike parking. It is hoped that by 2023 there will be 17,500 more bike parking spaces at Central Station. This figure should rise to 21,500 by 2030, the projected date for the bike pontoons to hit the water. 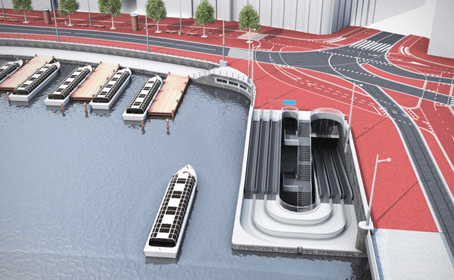 The renderings available on Amsterdam’s tourist portal seem to illustrate a stripping back of the central bus lines, as well as narrowing quaysides, allowing for more water and thus boat traffic.